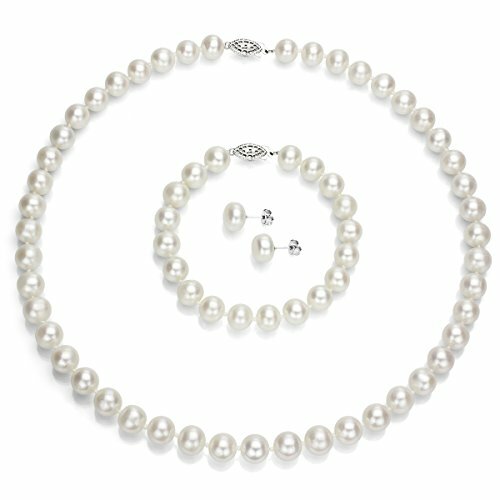 This is A Beautiful Sterling Silver 11-11.5mm White Freshwater Cultured Pearl Necklace 18" Length, with a Matching 7" Length Bracelet and a Button Shape Stud Earrings Set. We Carry Different Metal Type, Different Color of Pearl, and Different Size Per Pearl. Please Contact Us if You Do Not See What You Want. Perfect for Any Occasions. 925-Sterling Silver jewelry set, comes with an 18-inch length necklace that can be worn by everyone. Along with the necklace, you also get a matching bracelet and earrings set. The bracelet, and the earrings compliment the necklace and help you complete the look.